VIPs! The long awaited five-year anniversary of our favorite idol group is almost upon us — August 20, 2011. Let’s celebrate this momentous occasion in true VIP style by partying like only we know how. I Heart Big Bang/Pinoy VIPs, in cooperation with G-Dragon Philippines, T.O.P. 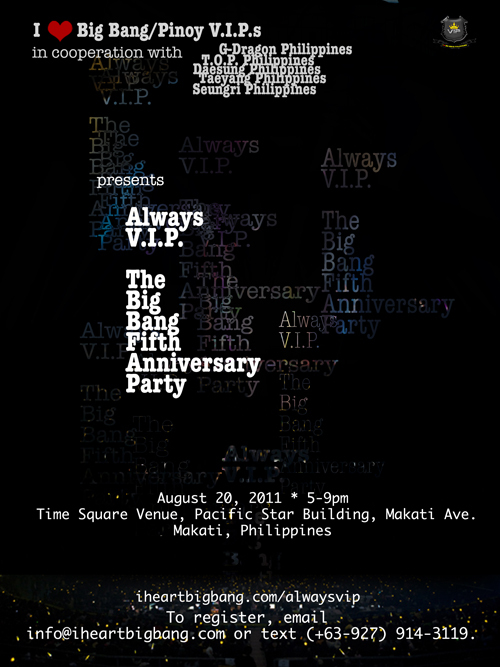 Philippines, Taeyang Philippines, Daesung Philippines and Seungri Philippines, presents “Always VIP: The Big Bang 5th Anniversary Party”. The magic happens on Saturday, August 20, at 5pm at the Times Square Venue along Makati Ave. in Makati City. There will be games, raffles, video screenings, great food, and awesome (Big Bang) music. You don’t have to be a member of I Heart Big Bang/Pinoy VIPs or any fan club to party with us. Anyone can come, so bring your sister, brother, grandma — just make sure they’re prepared to have a lot of fun and meet other VIPs! To register, e-mail info@iheartbigbang.com or text Fatz at (0927) 914-3119. See you soon! This entry was posted in Events, News, Party and tagged 5th anniversary, anniversary, Big Bang, Daesung, fifth anniversary, five years, G-Dragon, I Heart Big Bang/Pinoy VIPs, k-pop, kpop, party, Seungri, T.O.P., Taeyang. Bookmark the permalink.